Posted in: 2 Shout-out-Looks. Tagged: Bb. 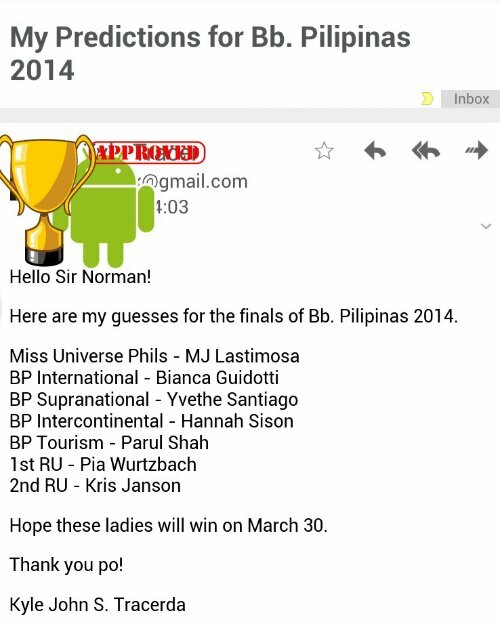 Pilipinas 2014, Fun Prediction Contest, Norman's Blog. After diligently studying the One hundred sixty-seven (167) entries to our Fun Prediction Contest, I have initially arrived at two (2) possible winning entries. Both individuals were able to guess four (4) of the Top 5 correctly. The first difference that gave one the edge over the other is that Kyle missed out on the 3rd-ranked Bb. Pilipinas Intercontinental crown, while regular poster Carlo placed the wrong name for the 2nd-ranked Bb. Pilipinas International title. Another advantage of the former is that he submitted his entry at 14:03HRS on March 28 (almost a full ten hours before the deadline) while the latter e-mailed his at around 20:45HRS on March 29 (nearly 24 hours after the deadline). So our winner (a homegrown entry for a change) is Kyle Tracerda (I’m not sure if it is his real name or not, but will find out soon enough) of Davao City. His entry is posted below. Kudos as well to Carlo who came so close. I would have declared a tie if only he hadn’t missed the cut-off date and time (which was met by 92% of the entries). I have already exchanged emails with Kyle about his win and he volunteered to shoulder the shipping expenses of the prize package to his home province (to be deducted from the cash prize). However, I insisted that I take care of everything since we have a trusted courier service at work. Posted in: 1 Pageant Pages, 2 Shout-out-Looks. Tagged: Bb. 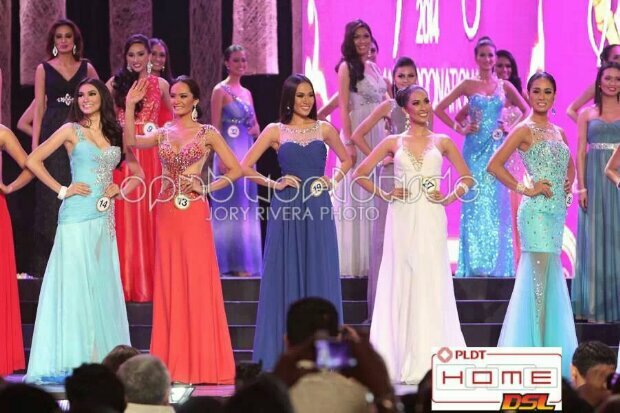 Pilipinas 2014, Bianca Guidotti, Hannah Ruth Sison, Kris Janson, Laura Lehmann, Mary Jean Lastimosa, Parul Shah, Pia Wurtzbach, Yvethe Santiago. It was a battle of the former runners-up alright. Up to the dying minutes of Bb. Pilipinas 2014, all the spectators at Smart Araneta Coliseum were on pins and needles cheering at the top of their lungs for either BBP2011 2nd Runner-Up Mary Jean Lastimosa or BBP2013 1st Runner-Up Pia Wurtzbach. It’s not like the announcement of the winner for Miss Universe Philippines came down to this that easily. The third-time joiner had to wait three long years before nailing the most coveted crown. On the other hand, last year’s sole lady-in-waiting patiently trained with the other Gold winners and sacrificed the offer to take part in a lesser-known pageant abroad to try her luck in this year’s beauty derby. In the end, the reward was given to the lady who took the longer road to victory. A most sweet win, I must add. It came at a time when MJ had the slimmest of age qualification to back up her bid. And the reaction upon hearing her name being called as the successor of Ara Arida made her cry so much that instead of reacting with calculated poise and confidence, she turned all humble and vindicated at the same time. Why, even anchorperson Shamcey Supsup was in tears when she saw her best friend finally harvesting the fruits of hard work and determination. 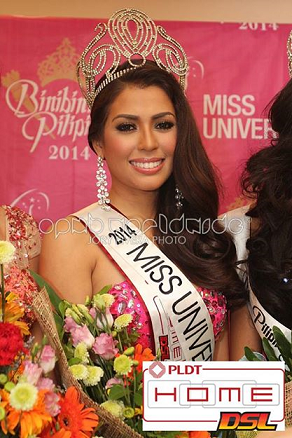 MJ Lastimosa had all the lucky stars aligning for her last night. She was in her finest elements all throughout. As for the other winners, the crowns were definitely expected even if the placements got all jumbled up one way or the other. Bb. Pilipinas International Mary Anne Bianca Guidotti and Bb. Pilipinas Supranational Yvethe Marie Santiago now have the most challenging reigns as they will wear the country’s sash abroad in pageants where the reigning titleholders are their predecessors in the nationals. But then again, back-to-back wins can be more glorious if they choose to take the mission more relentlessly. Bb. Pilipinas Intercontinental Kris Tiffany Janson wanted a higher finish. But winning the honor that allowed her to make history by being its first recipient will hopefully push the Cebuana to go all-out in the assignment and become the Philippines’ first Miss Intercontinental. She has things cut out for her, I believe. And for Parul Shah, she may have been given the least-exciting crown but in the final analysis, a victory is still a victory. Time now to look back at her Aliwan Festival days and dig deep in her pockets to see how she can possibly shine to the max in mainland China for the bigger competition. The two runners-up had it in the bag as soon as they completed their respective Q&A turns. I knew that Laura Lehmann and Hannah Ruth Sison did solid. It’s just that there were at least four others who were clearly being favored going into the segment. Landing 6th and 7th places respectively, they are now in seats of patience that would test their individual inner strength to fluorish with the new queens and make fresh new bids in 2015. All in all, it was a night of not-so-surprising results. The five (5) winners deserved their crowns even if my heart goes out to Pia Wurtzbach for not getting one. It could be a sign for her to look elsewhere and not be tied down by another contract with BPCI. My heartfelt congratulations to all the winners. Now starts the commitment to support our new Bb. Pilipinas 2014 representatives in the quest to further the impressive performances of last year’s quartet. Time to move on. Posted in: 1 Pageant Pages. Tagged: Bb. 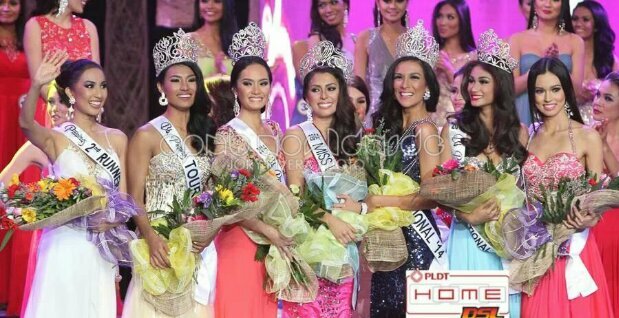 Pilipinas 2014, Bianca Guidotti, HANNAH SISON, Kris Janson, Laura Lehmann, Miss Intercontinental, Miss International, Miss Supranational, Miss Tourism Queen International, Miss Universe, MJ Lastimosa, Parul Shah, Yvethe Santiago. Since late January, we have seen all forty (40) Bb. 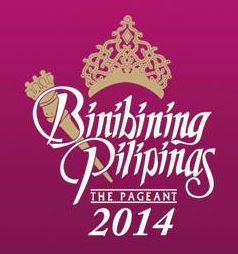 Pilipinas 2014 Official Candidates give their best in outlasting each other on the way to the five (5) crowns. So it is with pride that I present to you the Binibinis who survived and are now scheduled to represent the Philippines in Miss Universe, Miss International, Miss Supranational, Miss Intercontinental and Miss Tourism Queen International. 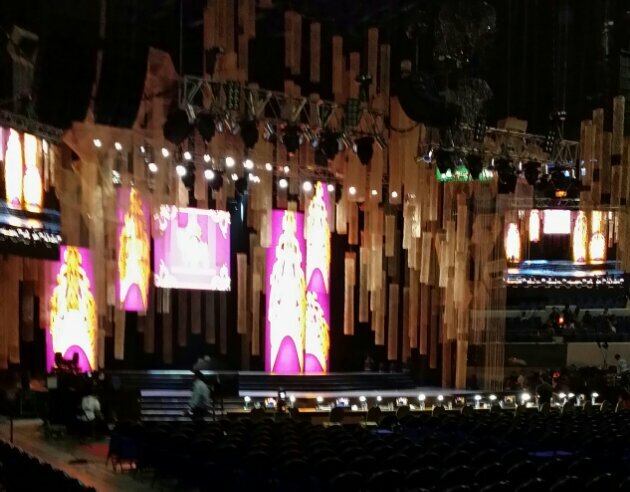 Sunday Specials: Live from the Araneta Coliseum, it’s Bb. Pilipinas 2014! Posted in: 1 Pageant Pages, 2 Shout-out-Looks. Tagged: Bb. 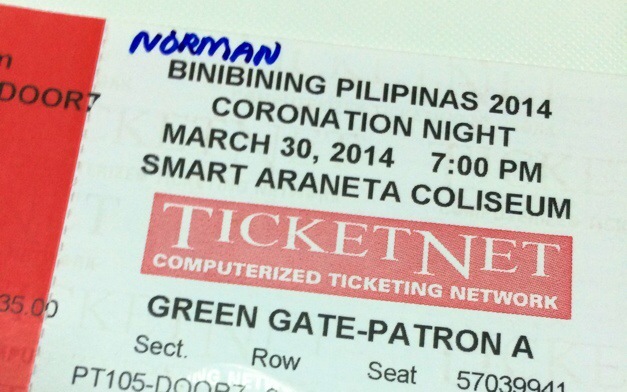 Pilipinas 2014, Smart Araneta Coliseum. 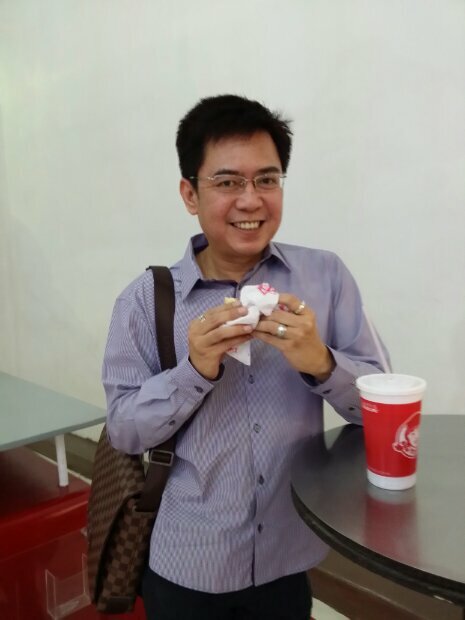 I am now on my way to Smart Araneta Coliseum to watch Bb. Pilipinas 2014. Real-time updates should follow in reasonable succession. If my style of writing gets intermittently altered in style (read: dazed and confused), it only means that I am getting a wee bit too excited for my own good. LOL. Grabbing a bite before entering the venue. The venue is slowly filling in. 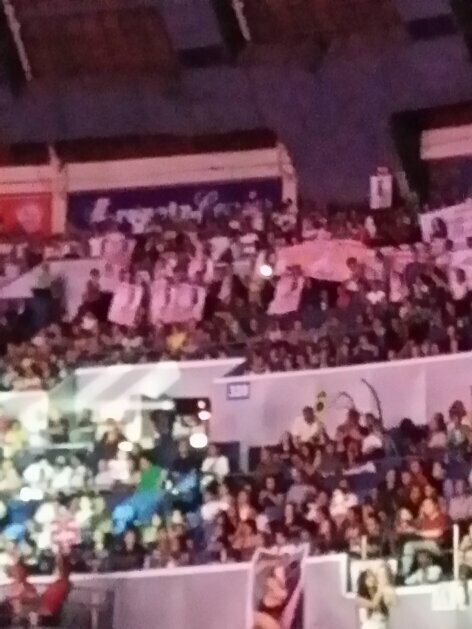 And the fans/supporters of each candidate are forming their spots in the upper boxes. 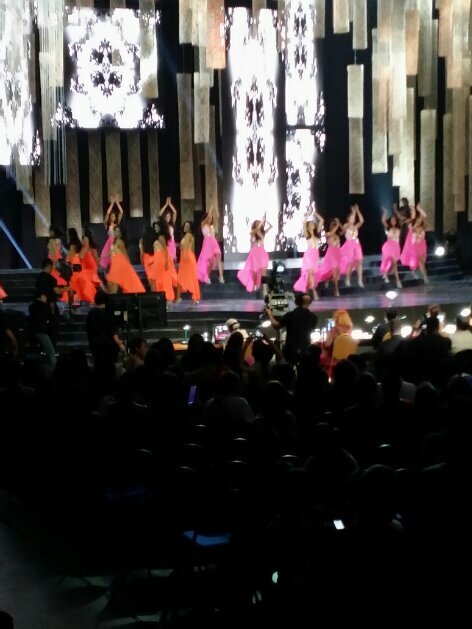 Swimsuit competition now. First batch standouts are Pia, Laura, Kris, Emma and Diana. Second batch standouts are MJ, Bianca, Hannah Sison, Joy Marie and Yvethe Marie. 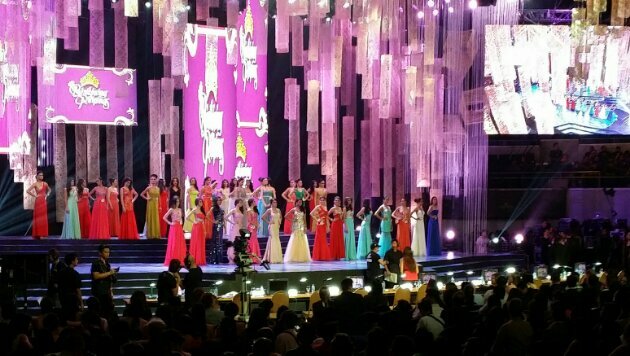 Long gown competition to start now. Standouts in the first batch are Pia, Emma, Kris, Diana and Laura. 2nd batch standouts are: Bianca, MJ, Hannah Sison, Joy Marie, Angelique and Yvethe Marie. Majority of them wore red evening gowns. 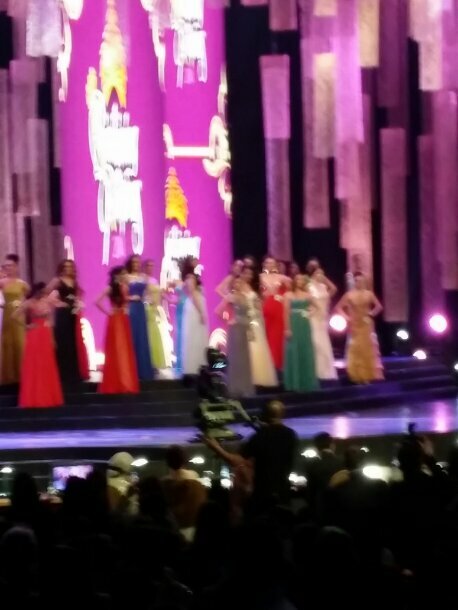 Hannah Sison and Pia Wurtzbach were in white. Diana was the only one in black. Yvethe was in powder blue. Second set of Special Awards up next. The fans' cheers are deafening! The Top 15 will be announced soon! Binibinis waiting for Top 15 anmouncement. Q&A for the first half of Top 15 up next. Laura describes the city representing her personality and nailed it. Julian talks about confidence. Short and sweet. Bianca speaks about her advocacy of putting up her own NGO. Joana explains that aside from love, all we need is beauty and goes on and on. MJ celebrates the beauty of the woman and her advantages in life. Pia explains on the best lesson a woman can teach the world. Parul touched on the Malaysian Airline tragedy. Nichole talked about the advantage of a beauty queen in landing a job. 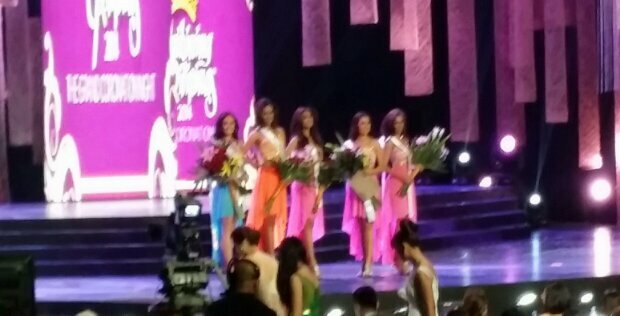 Among the first 8, the best ones would be Laura, Bianca, MJ and Pia. Zahara explained about Filipino heroism and blanked. Later on, she spoke about the OFW. Yvethe talked about the quality of the Filipina that makes her stand out in Miss Universe. Emma was asked about why the Filipina stood out in 2013. Kris was asked on what she could change if she goes back in time. Liezel stressed on her confidence. Personally, my Top 5 are Pia, Bianca, Yvethe, MJ and Kris. Hannah and Laura as alternates. The judges are deep in deliberation now. Behind closed doors. Emin to be interviewed by Shamcey and Janine. Waiting for their fate, the Top 15 are. 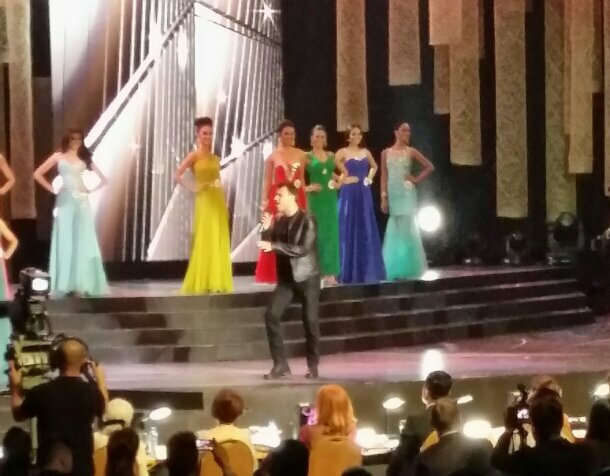 Due to long deliberations, host Anne Curtis obliged with an impromptu song number to the delight of the fans. May the Best Binibinis win tonight! Posted in: 1 Pageant Pages, 2 Shout-out-Looks. Tagged: Bb. Pilipinas 2014, Bruce Casanova, Smart Araneta Coliseum. Ever since the year started, I have been living and breathing Bb. Pilipinas 2014. Suffice it to say, not a single day has passed by without posting anything that has to do with the pageant – from teasers on possible applicants to the tedious screening process to the selection of Official Candidates to the Press Presentation to the long string of sponsor activities to the charity events to the talent/fashion show to the eye-opening TV primer to the all-important Gala Dinner at Sofitel to the rehearsals all the way to the day of the finals itself. Only five (5) will bring home crowns tonight. And my earnest wish is that only the best of the best will lay their hands on the same and start their reign immediately afterwards. If only I had it in my power to hand out all the national beauty titles for 2014 to this batch, I certainly will. Aside from the titles at stake, why not throw in the selection of our representatives to Miss World, Miss Earth, Miss Tourism International, Miss Grand International, Miss Tourism World, Miss Asia Pacific World, Miss Humanity International and what-have-you? Alas, that simply cannot happen. 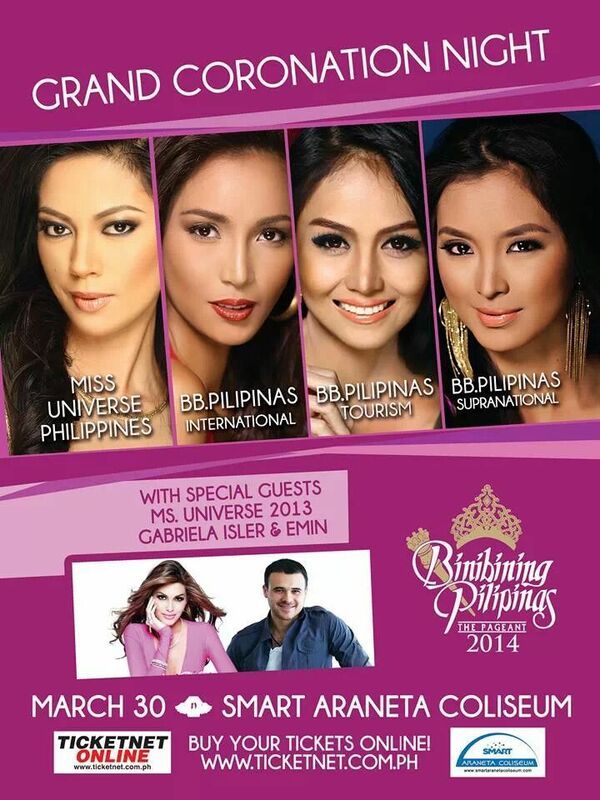 Regardless of affiliation, may the best Binibinis win the crowns tonight! Be that as it may, a quintet will shine above the rest. Who will these beauties be? 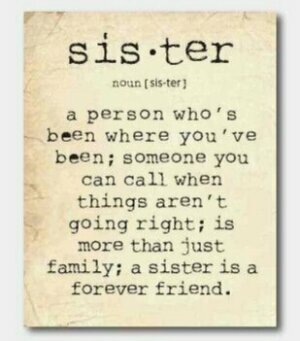 The most deserving, I silently pray. Posted in: 1 Pageant Pages, 2 Shout-out-Looks. Tagged: Bb. Pilipinas 2014, Montemar Beach Club. Some of the Binibinis during their 3-day working vacation in Bataan. 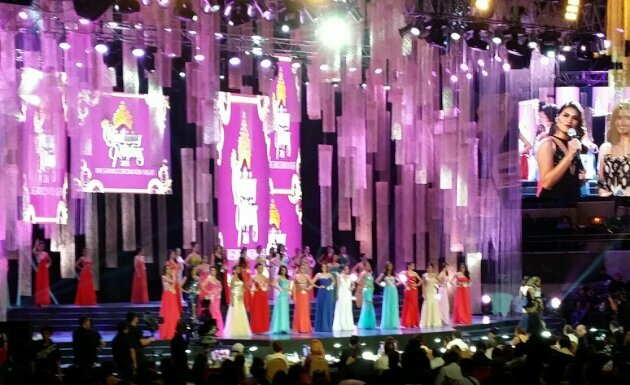 Despite the competition, a strong sisterhood was formed among the Binibinis. While we are not totally privy to the inner workings of what happens behind the camera with the Bb. Pilipinas 2014 Official Candidates, you only need to look at the photo grids and personally-taken images in this post to conclude that the friendship and camaraderie among them have been genuinely developed. 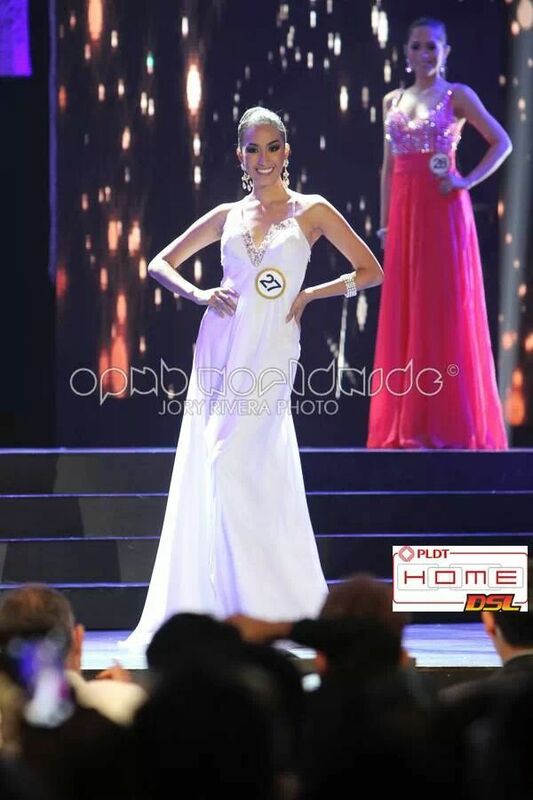 In fact, practically everyone admits that being a Binibini is such a fun and fulfilling experience. And I am convinced of that. Bonding in almost any activity, these Binibinis are. Sunday Specials: Can someone find a guy like John Spainhour for Mr. World Philippines 2014? Posted in: 2 Shout-out-Looks. Tagged: Bench, John Spainhour, Mr. World Philippines 2014. 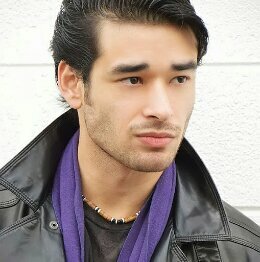 Fil-Am John Spainhour is a shoo-in for Mr. World Philippines 2014, don't you think so? Or better yet, why not him? Fil-Am John Spainhour is the tall, gorgeous and ex-US Marines of a hunk who is also a popular fashion model and one of the more successful endorsers of Bench Body. In fact, his latest ad campaign for the underwear line is plastered in all of the bigger Bench stores in Metro Manila nowadays. In some shots, he could be a deadringer for American Idol judge and popular crooner Harry Connick Jr. But the moment he steps on the stage, he takes on the look and personality that is unmistakably his. For Mr. World Philippines 2014 purposes, his stats couldn’t get any better. He is 26 years old, stands 6’1″ and is as physically fit as the serious tri-athlete. After all, he went through all the harsh and punishing training for US Marines – something being mimicked by Mr. World in some of their events. And can he stand side-by-side the more well-chiseled male reps of other countries? I bet he will.